Do you hear that? That’s the sound of my sewing machine being revved up for the first time in 7 weeks! I really needed to get back to the sewing world- I didn’t know I’d miss it so much! Anyway, I took Corinne on her first thrift store trip the other day and we scored some good stuff, including a few vintage pillowcases for $.50 each. With all the Vintage May goodness going on at Skirt As Top and Craftiness Is Not Optional, I was inspired to bring one back to modern day life. 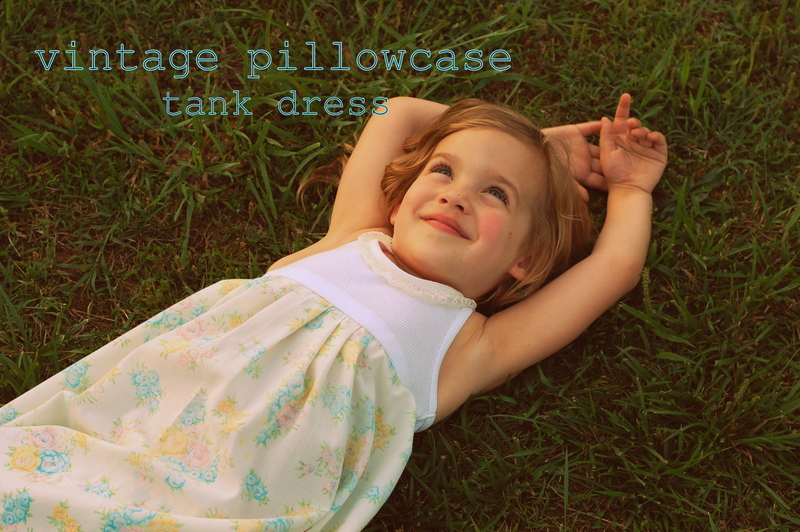 A quick and simple dress involving nothing more than a plain tank top and a pillowcase. Wanna make one? 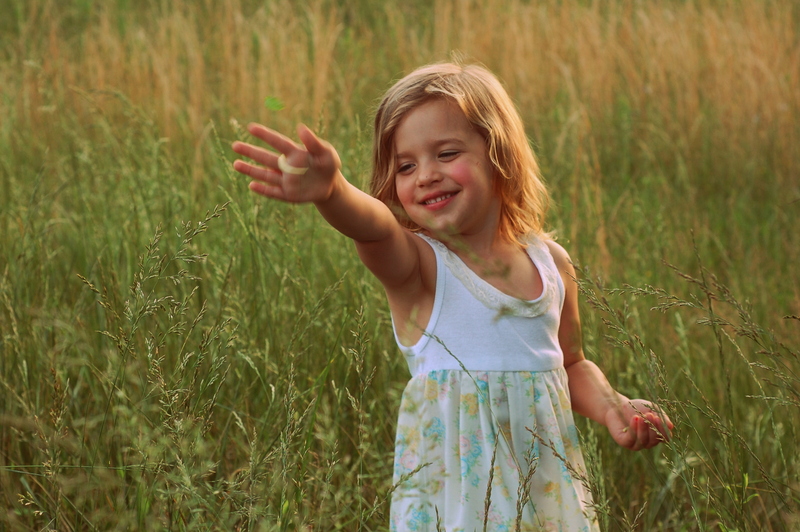 Then read on…. 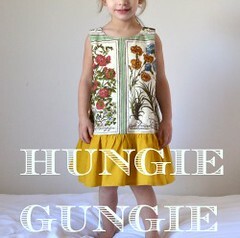 Next, get an existing dress that fits your little girl well. Use it as a guide for measuring the length to which you’ll cut your tank, and the length of your skirt piece. Add an inch to the tank and to the skirt piece to allow for a seam allowance. 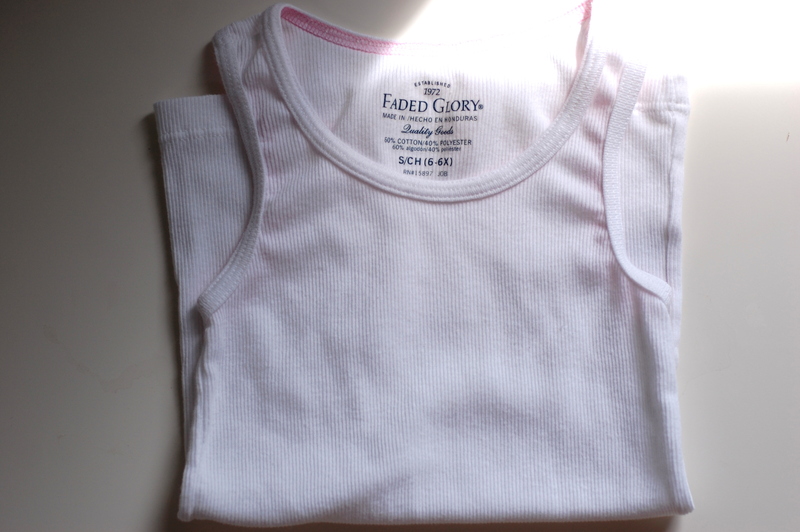 **For my average-sized 4 year old, I cut my tank about 3″ below the bottom of the armhole. 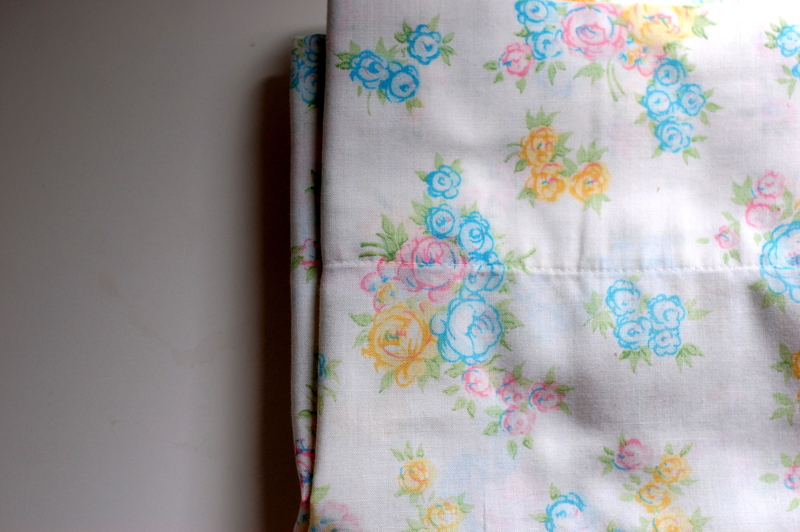 Most pillowcases have one side seam. This seam will then become the middle of the back of your dress. Next, mark the center of the front of the skirt piece. Make some some pleats 5-6″ across the front. I kind of winged it (wung it? )- mine are about 1/2″ wide. It helps to iron them down a bit. 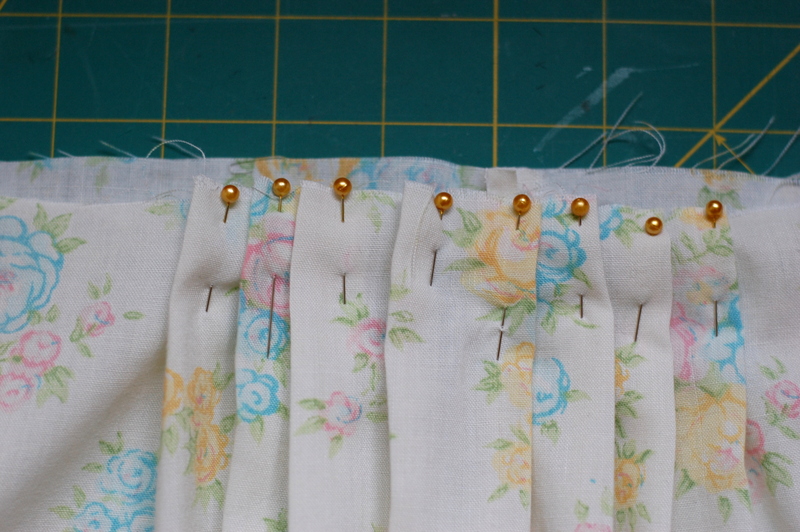 Pin those pleats, and then sew vertically about 1″ down the fold of each pleat to keep it in place. 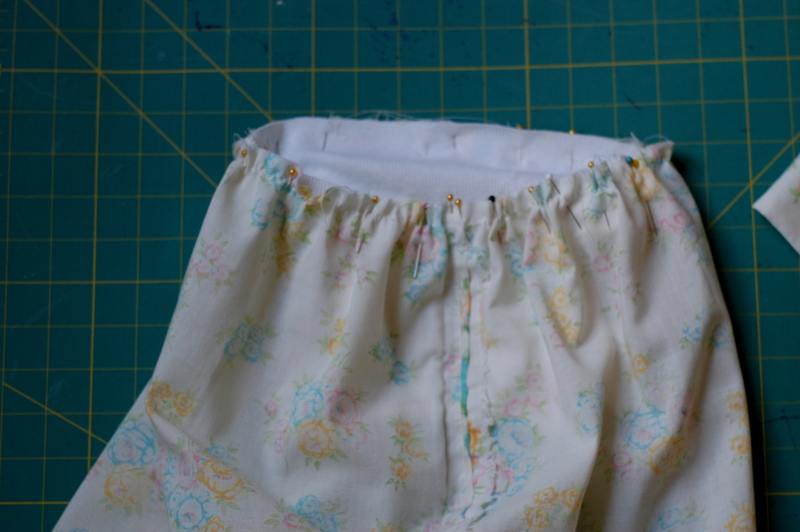 Also sew across the raw edge of the pleated area using a 1/2″ seam allowance. 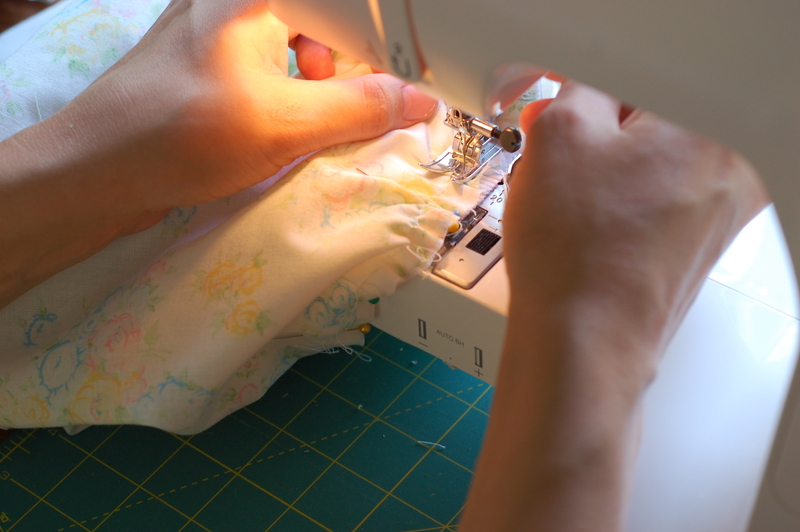 Next, you want to sew a gathering stitch (use your longest stich length and don’t backstitch at either end!) from one edge of your pleated area to the other edge of your pleated area using a 1/2″ seam allowance. **don’t sew along the pleats! Measure the width of your child’s chest. 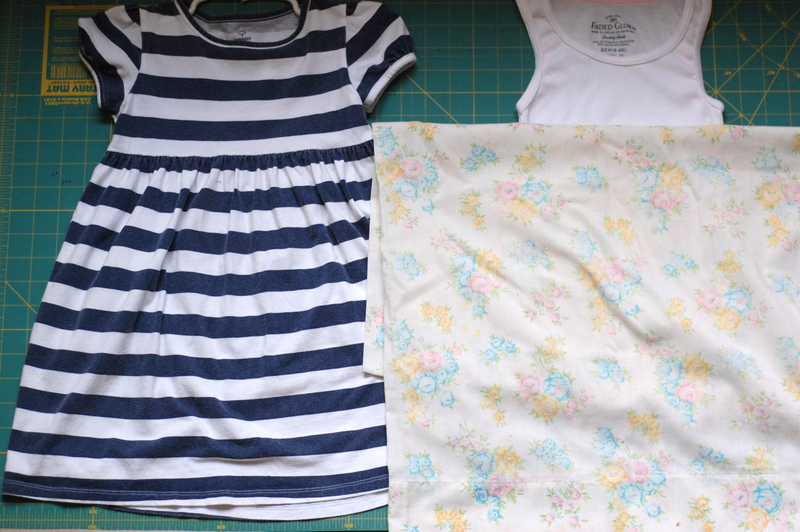 Gather your skirt piece to equal that measurement PLUS a good 2″. 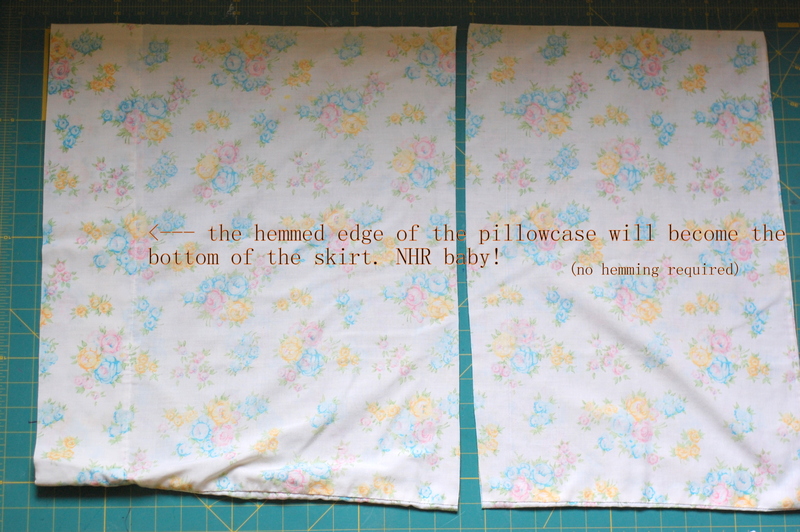 Ellery’s measurement is 21″, so I gathered my skirt piece to be about 23″ wide. 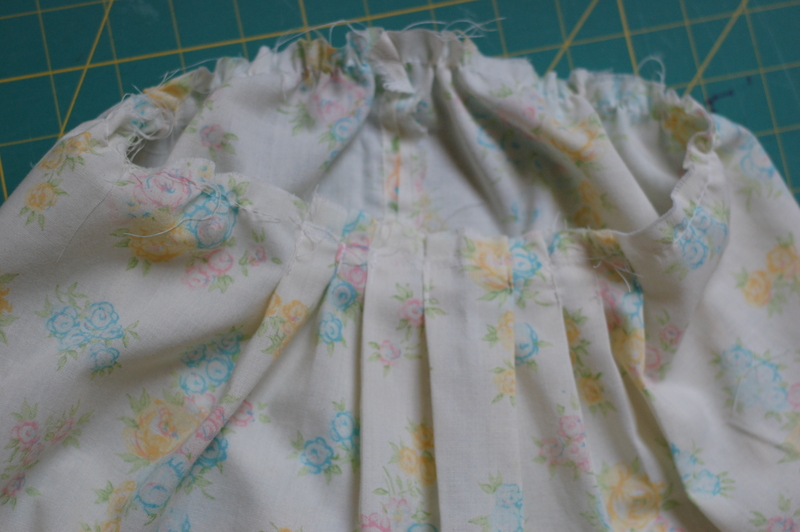 **pull on the long threads that are at the ends of your gathering stitch to create the gathers- i try to keep most of the gathers in the back of the skirt piece since the front piece is pleated. This will make sure that your dress has some nice flow room in the front and the back of the dress. Make sense? Okay. Next, turn your skirt piece inside out. 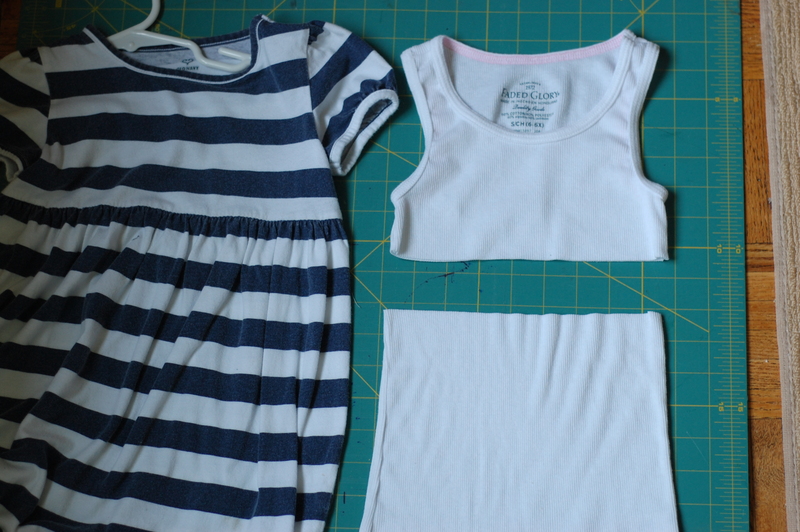 Then, insert your tank top (neckline first) into the skirt piece. The back seam of your skirt should line up with the back tag of the tank top (right sides together). Meet the raw edges together and pin in place. This can seem confusing the first time you do it, but think about it for a minute and you’ll get it! If you hold it up, it should look like this. 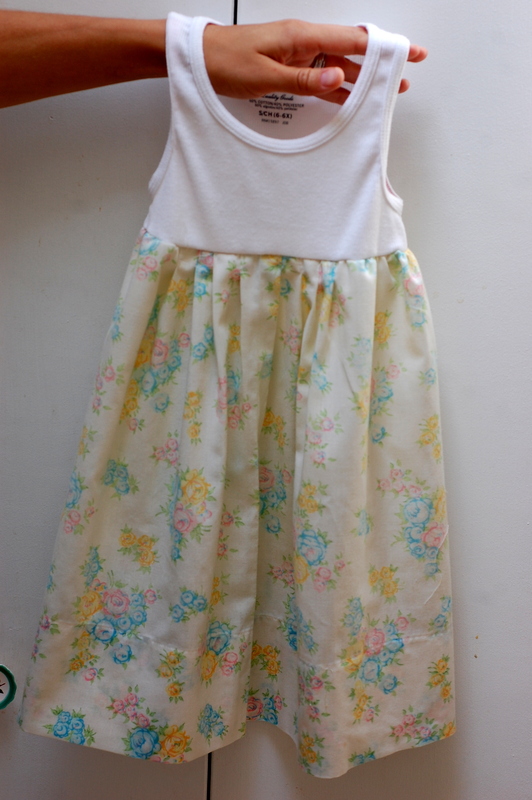 Okay, next you’re going to sew the tank to the skirt. You’ll need to handwind elastic thread onto a bobbin (this video can help you if you’ve never done this). 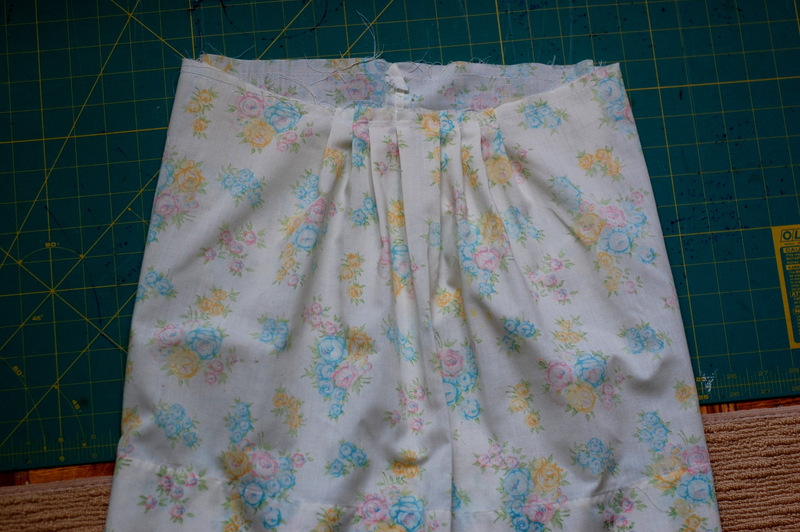 Sew completely around the skirt using a 5/8″ seam. Sew one more line of stitches very close to the previous one- just for good measure. 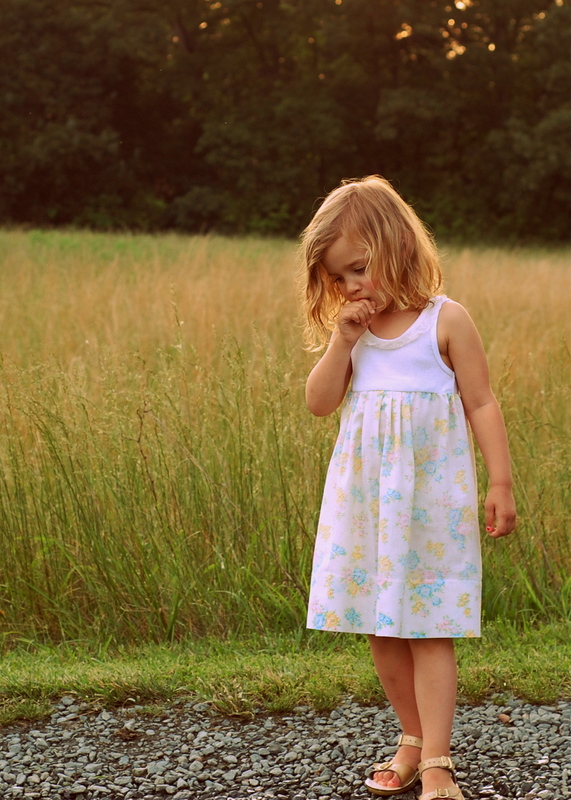 Using the elastic thread technique will ensure that the dress can be pulled on and off easily and have some give, but also fit your child snug around the chest. Now turn your dress right side out to admire your handiwork. And my sisters well-tanned arm. No fair. Give it to your girl! I love how simple this dress looks, and I like the front being pleated instead of gathered…but I thought it needed a little more detail. 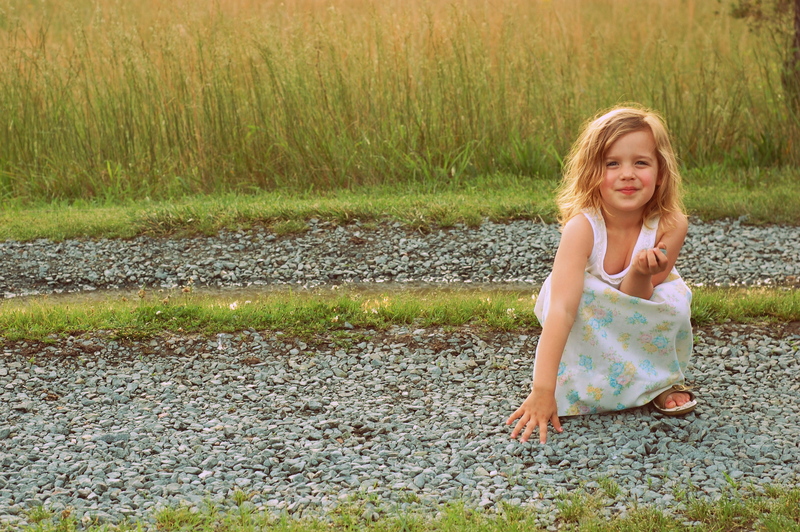 Here is the real finished dress… and my sweet girl being the BEST child model ever! No bribes needed! Too cute! Your girl is a natural model, but mama a good photographer as well. Even if we can never find time to actually get together and sew, I get a little kick out of watching your projects in the virtual world. Thanks! I don’t know what I like better, your sewing or your photography! oooo this is so great! i need to make one of these. 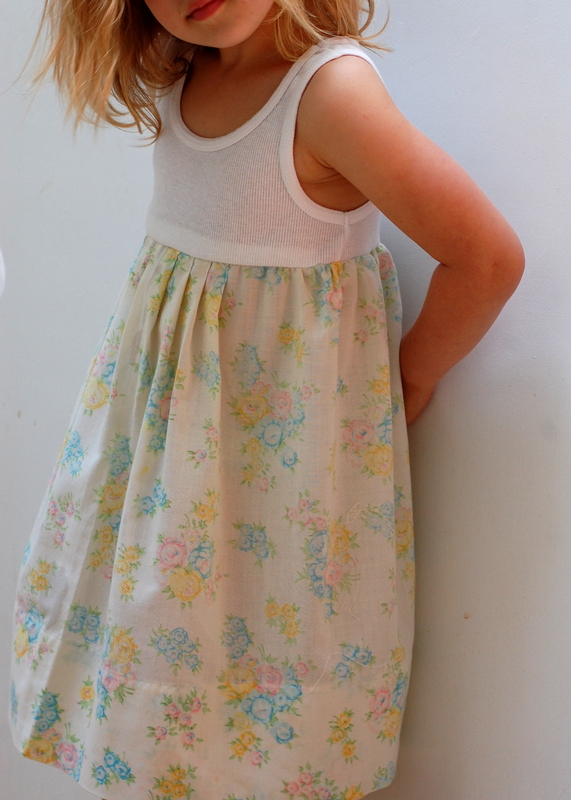 thanks for sewing along for vintage may! 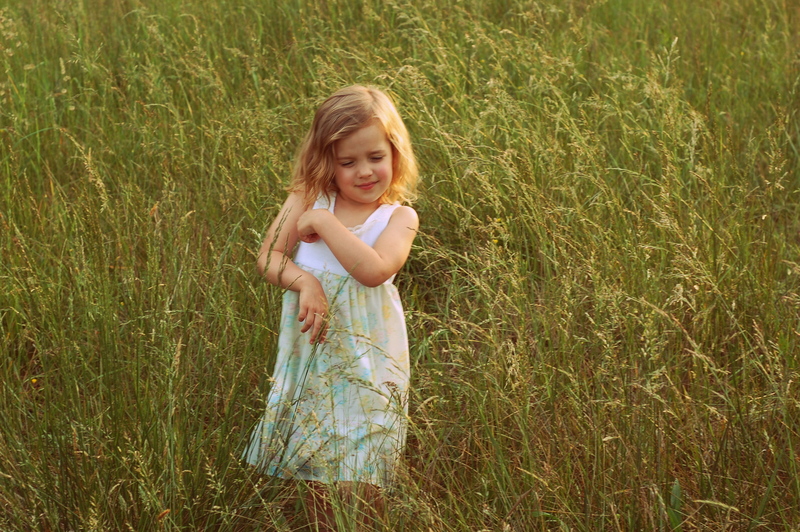 the photos are fantastic, too…though “snake-infested field” totally makes me shudder. A great idea, beautiful dress and stunning photos!! Thanks for the inspiration. Wow, Ellery was werkin it for you! She is so beautiful. Those are photos for the wall! I love these new episodes of America’s Next Top Model! And, by the way, how come I am way down at the bottom of the comments list? Must have been busy. Breathtaking! Darling dress. 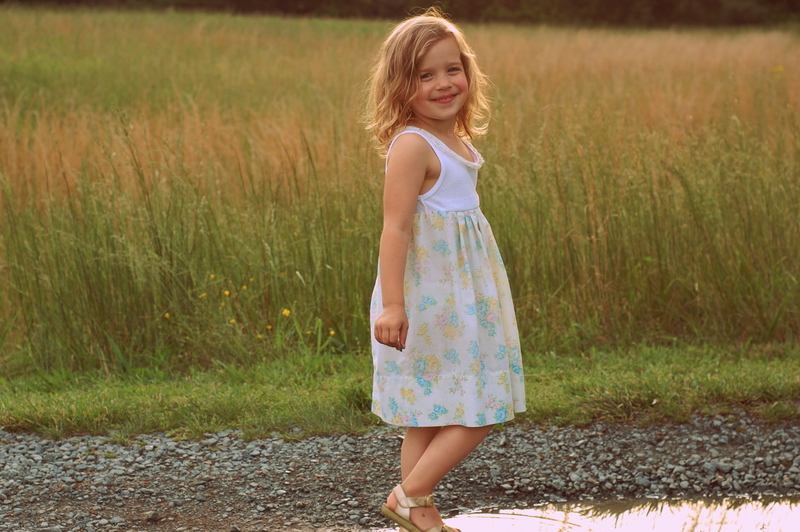 I love simple styles on little girls. Perfect! This is so sweet! Thanks for stopping by! That dress is just adorable! 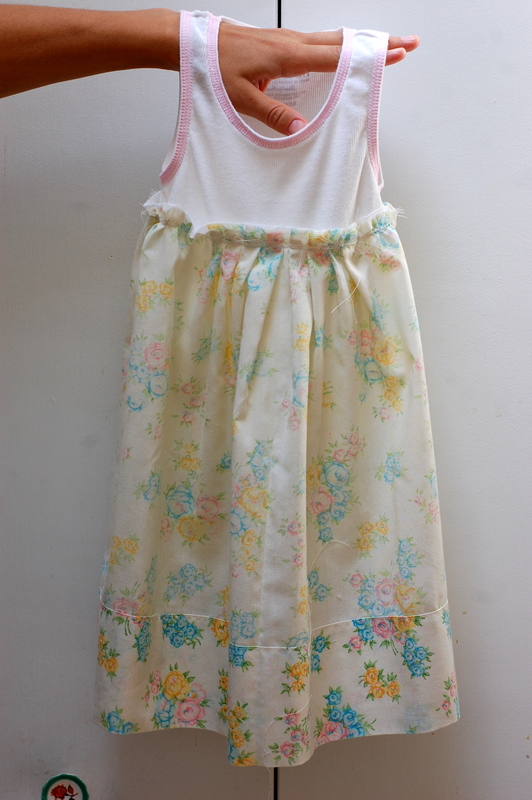 Thanks for sharing this idea with us, I never thought of making dresses out of vintage pillowcases. Wonderful! This is great! I found a pillowcase with a ruffled edge in my stash, and it will work perfectly 🙂 I do have one question – I’m measuring the chest of my (slightly above-average sized) 4 year-old, and it’s 12″….since yours was 21″ I had to wonder, am I doing something wrong? Hi there Alison! Make sure you measure all the way around her chest and back. 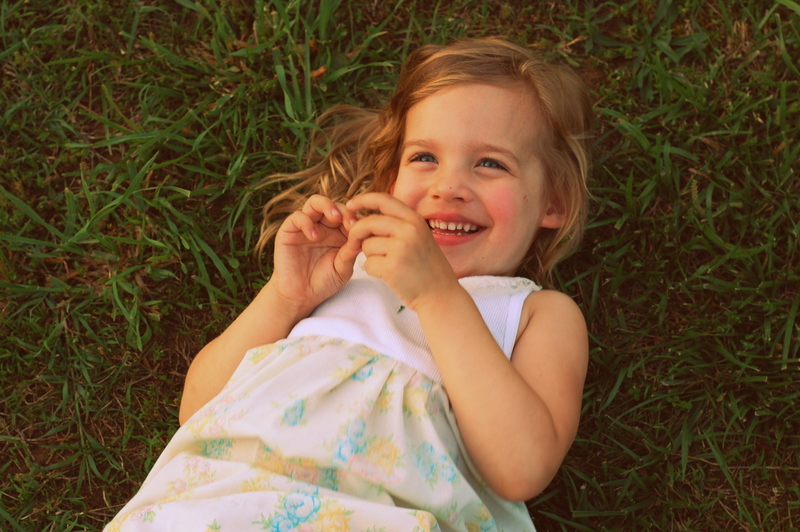 My now 5 year old’s chest measurement is 23″ for example. My 13 month old’s is around 19″ i think… let me know if you need any help! Hi! Yes, it should work fine- just use the longest stitch length that you can (mine goes up to 4). As long as you gently stretch your elastic while you sew it to the fabric, you’ll be fine. And so cool that you lived in Cville! When?? Awesome! Finally going to make one for my boy this weekend. He asked when i was making his dress “because sometimes I just want to wear a dress! 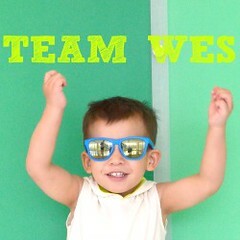 !” what a cutie! I was in C’ville from…. 2000 to 2008. Can’t believe we’ve been gone 6 years now! 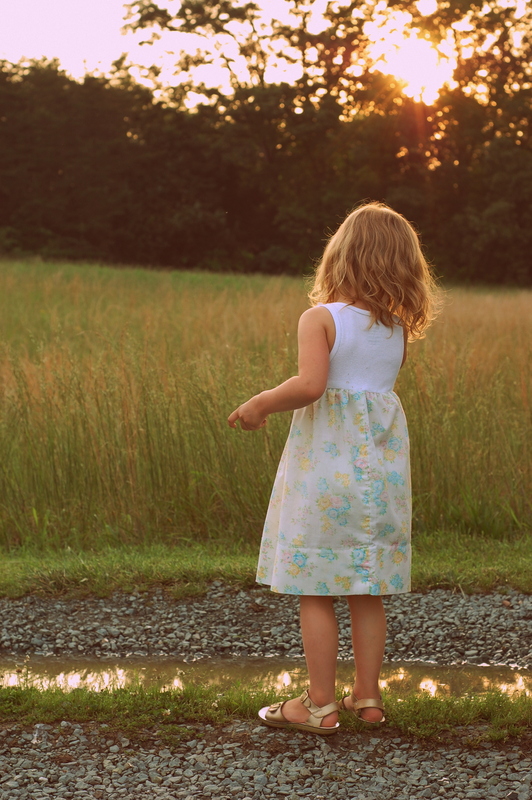 We still miss Sticks, Zazu’s, Harris Teeter….